Supposed more moderate stance calls for state on 1967 lines, but still refuses to recognize Israel. 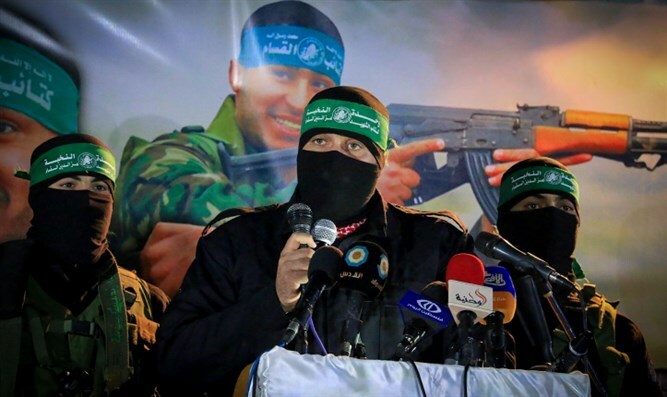 The Islamist terrorist organization Hamas unveiled Monday a new policy document supposedly easing its stance on Israel after having long called for its destruction, as it seeks to improve its international standing. The document notably accepts the idea of a Palestinian Arab state in territories liberated by Israel in the Six-Day War of 1967. However, Hamas officials said the document in no way amounts to recognition of Israel as demanded by the international community. "...Hamas considers the establishment of a fully sovereign and independent Palestinian state, with Jerusalem as its capital along the lines of the 4th of June 1967, with the return of the refugees and the displaced to their homes from which they were expelled, to be a formula of national consensus," it says. The movement's leaders have long spoken of the more limited aim of an Arab state in Judea and Samaria and the Gaza Strip without explicitly setting it out in its charter. But after years of internal debate, the new document formally accepts the idea of a state in the territories seized from Jordan and Egypt in 1967.
the supposedly more moderate party of PA chairman Mahmoud Abbas. Hamas's announcement comes ahead of Abbas's first face-to-face meeting with US President Donald Trump in Washington on Wednesday. The new document was posted online as exiled Hamas leader Khaled Meshaal was due to hold a press conference on it in Doha. The press conference was also being broadcast live in the Gaza Strip.